Time for comfort food. This is great on the day it is prepared, but even better a couple of days later, so it is one of those perfect dishes for entertaining. I went the extra mile and cut the pieces of meat myself, from a large bone-in pork shoulder. I suspect if you buy pork stew meat it will work nicely too, and save you quite a bit of work. Zen work, but… sometimes even that seems a bit much. There is a ton of flavor, so you don’t need to brown the meat, just marinate it overnight and it will be perfect. 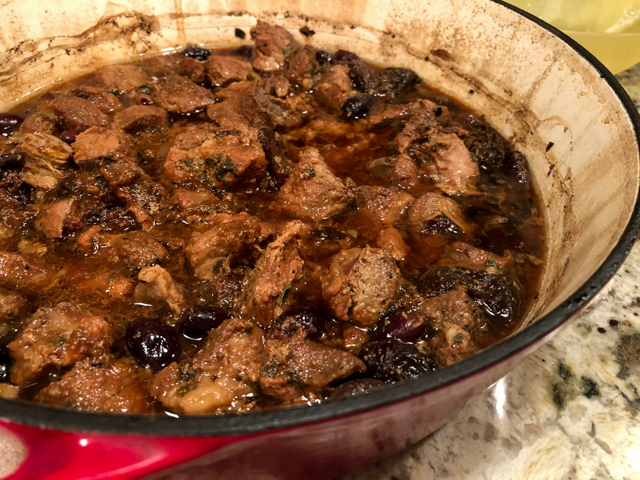 In a large freezer bag add the diced pork, wine, prunes, olives, capers, Herbes de Provence, salt and pepper. Seal the bag and marinade overnight in the fridge. Before cooking it, take out of the fridge a couple of hours before it goes in the oven to bring it to room temperature. Put the marinated pork into a large casserole dish, then add water. Stir together, put the lid on cook in the oven for 2.5 to 3 hours. The pork will be soft and tender. Sprinkle with fresh parsley if so desired, and a nice squeeze of lemon juice. Comments: Perfect meal to prepare during the weekend, although it could also be marinated early in the morning, stay full day in the fridge, and cook in the evening. Then it can go back to the fridge for a fantastic dinner next evening, absolutely effortless. If you don’t care for capers or briny flavors, this might not be for you, it’s really the most prominent flavor. I happen to love it. 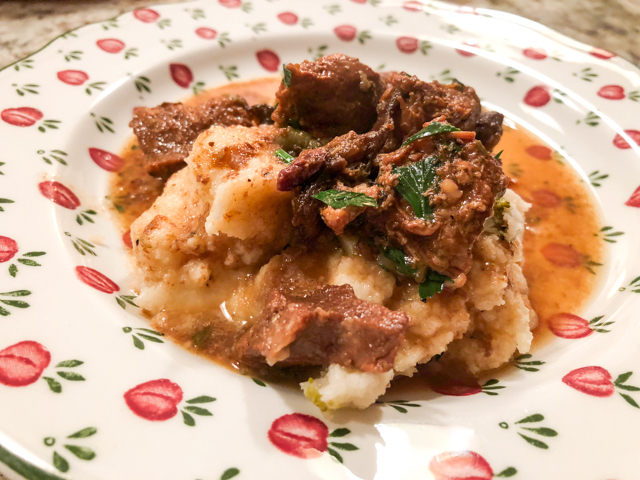 We enjoyed it with cauliflower puree, but obviously it would be a nice match for other side dishes, from mashed potatoes, sweet potatoes, or even a hearty pasta too. This would put a big smile on my face! it is indeed a smile-inducing meal! In the very mild climate of my abode I never really think in terms of ‘comfort food’. But love the sound of this with its olives and capers and ease of preparation: and no need to fry for health reasons already ! I am well used to the ‘couple of days later’ concept with two curry-mad husbands in my past . . . these are always the best on the third day . . .
I’m totally making this. I’ve pinned it on my “I definitely need to try this” board, where only the best sounding recipes go. We don’t entertain that often, but I love something that is totally make ahead so I can spend time with my guests without stressing. 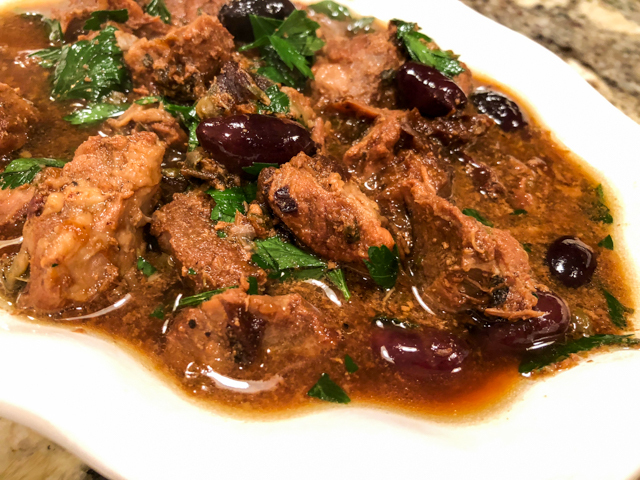 I am also quite taken by briny flavors – come to think of it, the last thing I had before going to bed last night was a few Kalamata olives… hummmmmm…. Sounds delicious, I adore meat wine fruit. Perfect cold weather food.